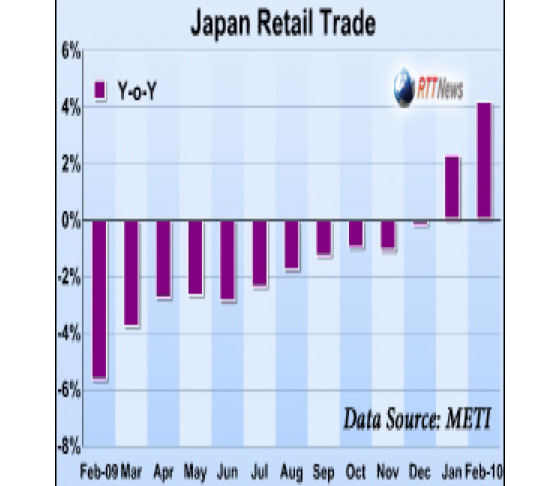 Despite the fact that Japan’s core consumer prices fell 1.1% in February, (deflation discourages people from spending money since they expect to have lower prices in the future) Japanese consumers have come out in force to spend their money. Retail sales jumped 4.2% year over year in February, which was the largest increase in 13 years. It was also a faster growth rate than the 2.3% posted in January and well ahead of analyst expectations of just 1.6%. The jump in February retail sales was led by increases in five out of seven major components. Fuel sales surged 20.7%, followed by motor vehicles sales, up 15%. Positive contributions also came from machinery & equipment, fabrics, apparel & accessories, and food & beverages. On the other hand, yearly declines were seen in sales of general merchandise as well as other retail sales. Compared to January, however, retail sales were down 6.5% in February to the lowest monthly value recorded since February 2009. It follows a 14.5% fall in January. It looks as though auto-related purchases had a large effect, and perhaps there was a distortion to this year’s seasonal buying pattern. In fact, many analysts remain bearish on the sustainability of consumer spending growth and Japan’s abi lty to come out of deflation, regardless of February’s surprise, according to the Wall Street Journal and Bloomberg. They’re smart to be too since betting against Japanese deflation has had a horrendous track record and it’s hard to believe that Japan’s government will be able to meet their target of defeating deflation this year. But… the Japanese retail spending surprise might be signaling a change in consumers inflation/deflation expectations. Consensus missed it, which means consensus could be wrong in its view. Inflation/deflation expectations can stay the same for years, but then change on dime. January and February retail sales were strong. Let’s see how March goes.